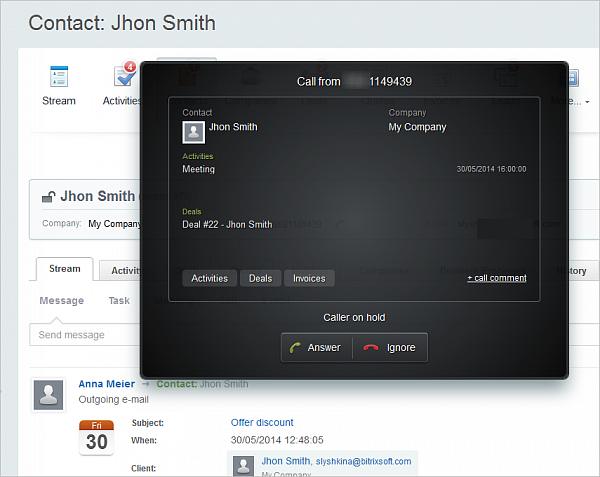 The functionality of Bitrix24’s built-in telephony has been expanded to include a virtual PBX – this allows you to receive and route incoming calls to employees. 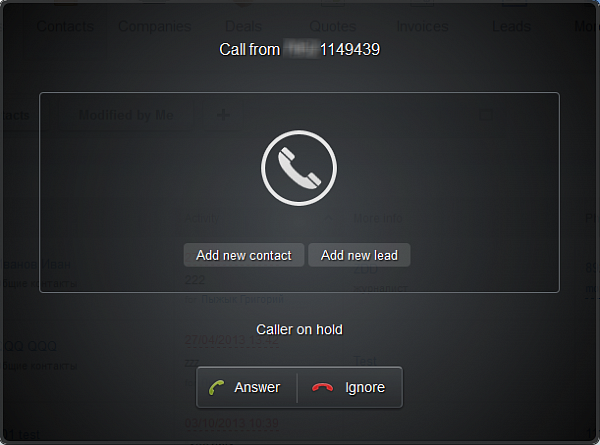 For only $6.00-$11.00/mo, you can rent an incoming phone number in the USA, the UK, or Russia with full capacity to accept calls via your Bitrix24 intranet. So, if you have decided to rent a number. Connect to your number - you can connect your number for outgoing calls so that contacts you call will see your correct number and be able to call you back. 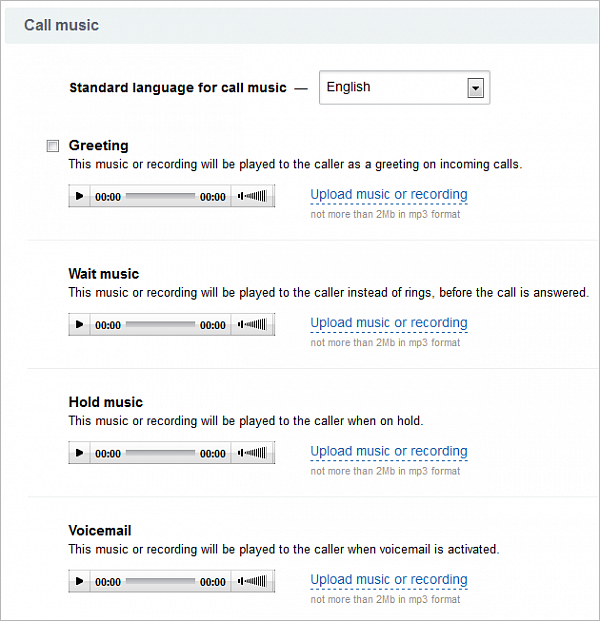 However, if you enable this option, incoming calls must be received via a “real” telephone. Details here. 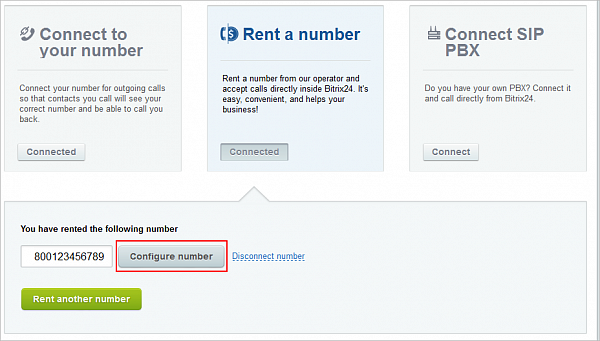 Rent a number – you rent a number and work with incoming and outgoing calls inside Bitrix24. 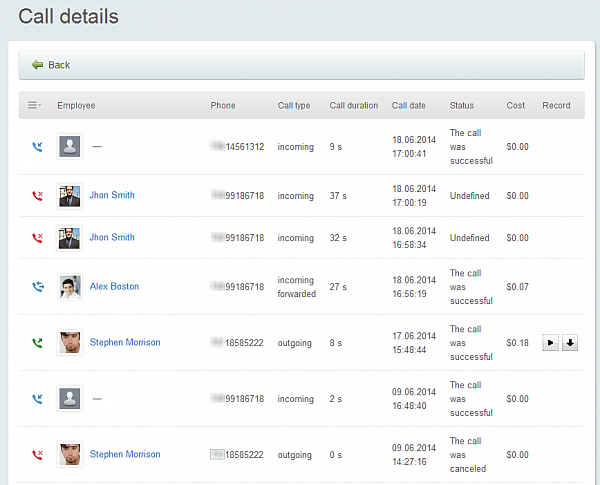 Connect SIP PBX – connection of your own SIP – this is coming soon. 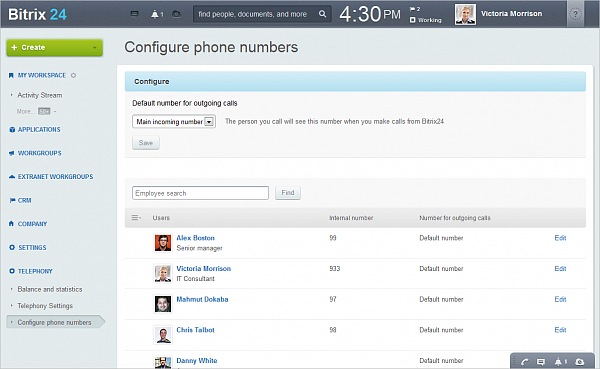 A single Bitrix24 intranet can be connected to your own number and use an unlimited number of rented telephone numbers. Be sure that your telephony balance is above the minimum requirement (not less than $6.00-$11.00). Top up your account via Balance and statistics. 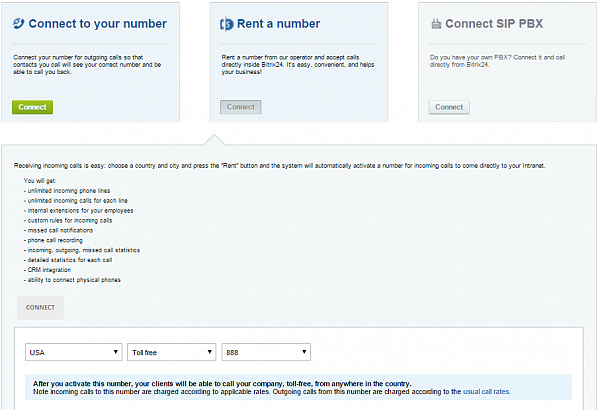 On the Telephony Settings page you can choose the corresponding option (Rent a number) and then enter your country, region, and code which you want to have for your rented number. 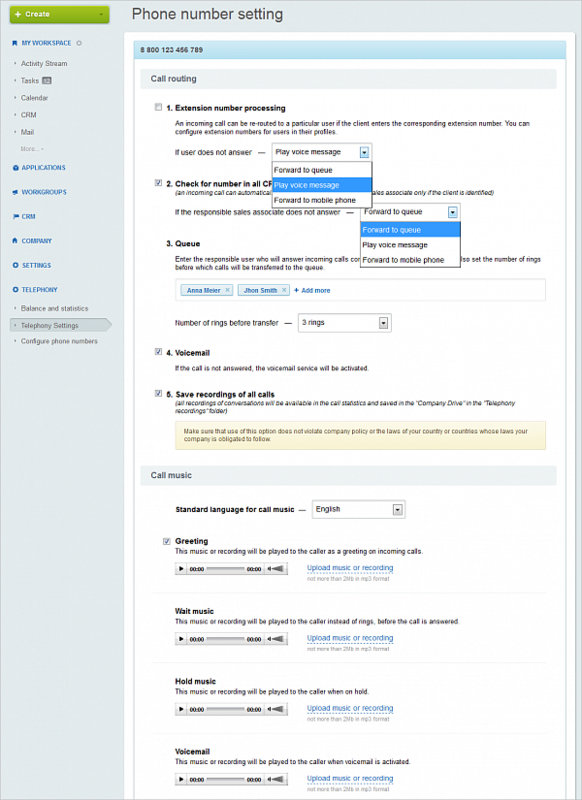 Configure extention numbers for employees. 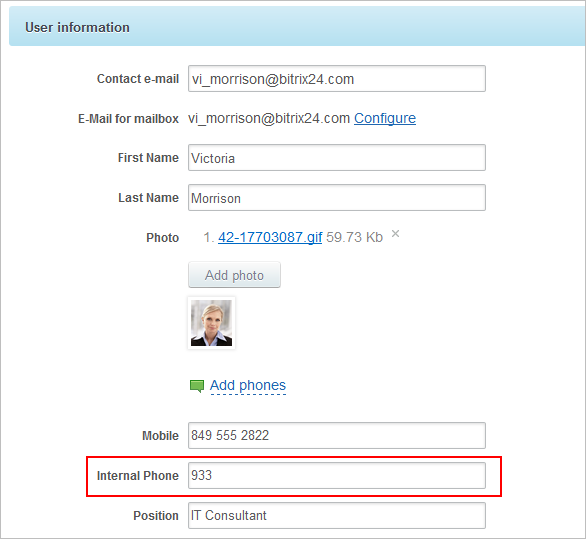 Each employee can put in an extension number in the ‘edit profile’ page. That’s it! 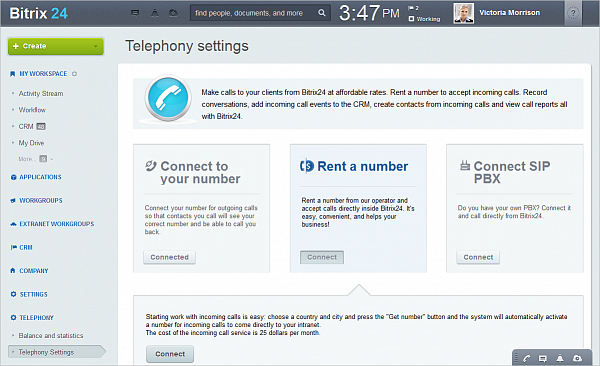 Call your clients and answer their calls using Bitrix24.Telephony. 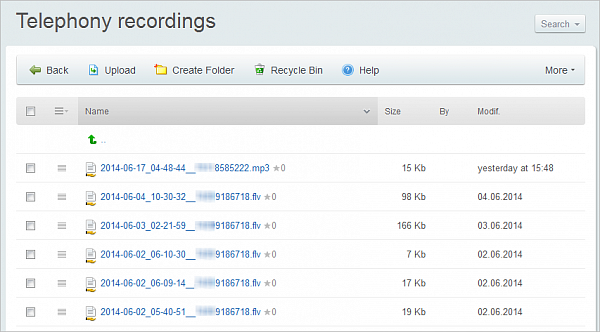 What is the difference between the Cloud and Self-hosted versions?